When the weather forecast starts mocking you with single digits, this stew hits all the right notes. Three degrees is simply not enough degrees! Brrrr. Somehow there was not a single rutabaga recipe on the site! I don’t know how that happened because rutabaga is basically my spirit vegetable. With all it’s purpleness and earthiness and intensity. It’s like a wizened turnip. But if you can’t find any, turnips or parsnips would be great here, too. So when life gives you three degrees, make this stew! Serve with some jasmine rice and warm up your life. ~I like coconut oil in here for obvious reasons, but any neutral flavored oil will do! ~I’ve been really digging those little 5.5 oz cans of coconut milk. It’s so efficient and there is zero waste. If you can’t find them, then just measure out 2/3 a cup of coconut milk and you’re good to go. ~My brussel sprouts were little so I just halved them. If yours are on the bigger side, quarter them instead. ~The easiest way I’ve found to peel a rutabaga is with your chef’s knife. Place the rutabaga on your cutting board and gently slice away the waxy skin starting from top to bottom. Preheat a 4 quart pot over medium-high heat. Saute onion in the oil with a big pinch of salt, until onions are lightly browned. Now add the brussels and try to get them lightly seared by making sure that they hit the surface of the pot. So just push the onions to the sides and let the brussels cook, giving them a stir every now and again. It doesn’t have to be perfect and not every single one needs to sear, just do your best! Add coconut milk and lime juice, and taste for salt. Heat through, and serve with cilantro and extra red pepper flakes or Sriracha if you like. This was perfect after a 17 mile run at -20F. Thank you!! I’ve never put chickpeas in soup. Why??? I am making this as soon as possible! So, rutabaga = swede turnips? Thanks Debbie! I want to make this right now! I’ve been meaning to try a rutabaga recipe. Im from omaha but have been living in Boulder for the past 6 years, Glad to support a fellow homey. Isa, all of your recipes look and sound amazing. My stomach literally just growled while I was reading this recipe. Sadly, all I have to eat is one slice of Tofurky pizza :( Gotta go grocery shopping and make this soup!!! Isa Does It rutabaga style! Thank you! Oh my goodness, I wish I had some of this soup right now! I love rutabaga and brussel sprouts..and coconut milk…yum! Perfect! This is so next on my list. I made this tonight following the recipe exactly. It was AH-mazing. Thank you! I’ve never had rutabaga to the best of my knowledge, but, well… If I hate parsnips and turnips, is there any chance I’m going to like rutabaga? Every ingredient present in the fridge and pantry. Rutabaga are small but we are very proud to say they grew in our own (now frozen) garden. Here we go ! Thanks, Isa. Mmmm…Sriacha! Good on top of anything! What a beautiful and hearty meal this is! I don’t have rutabaga or brussel sprouts. What can I use instead? I have cauliflower, spinach, potato…will that be ok? Cauliflower and potato sound good! But cauli is much more fragile than brussels, so skip the searing step, I’d say. Terrific! My skeptical husband loved it. We two oinkers were able to finish the entire soup in one meal. He should have known – one can always trust an Isa recipe. I made this last night without the rutabaga and it was awesome! The broth was incredible. I don’t have the words to express how good this is! The unusual combination of ingredients blends into a powerhouse of flavor. It’s delicate, yet hearty. This is definitely a recipe that I will be making again and again. Thank you! Loved this! Not sure if I’ve ever had a rutabaga before, but it was awesome and now I want more! I did dump a whole can of light oconut milk in here because I didn’t want to waste it (couldn’t find those little cans you mentioned–I’m jealous, they sound perfect!). Turned out great. Perfect for a snowy evening after an extra long commute home! Thanks again for a delicious meal. I loved all the different flavours. Such a great taste-experience. Spendid! Please, sir, I want some more! Holy guacamole this recipe is delicious. I made it last Saturday and I am still eating it (and it is still as delicious as it was Saturday). Keep on giving love to those Brussels Sprouts! We made this soup tonight and it was delicious!! One question: is it 2/3 of a cup of coconut milk or 1/2? The recipe notes say 2/3 but the ingredients list 1/2. Thank you so much for this amazing looking recipe! I love healthy recipes and I will look forward to trying it out and sharing it with my followers at TianaGustafson.com. As Arnold says “I’ll be back” :) Thanks again! Made this recipe for dinner tonight. It was delicious! I followed the recipe exactly and it turned out very well. Thanks for sharing! Made this last Sunday and it was incredible! Thanks Isa. When my husband asked me what I was making for lunch today, he instantly frowned. He HATES ginger, rutabaga and isn’t very find of Brussels sprouts either. All things I personally love. As he was hesitating to bring his spoon to his mouth he said, “is this a Isa recipe?” I said, “yes..” He took a spoonful and low and behold he loved it. He ate two bowls, I ate two bowls, my mother who is the pickiest person in the world ate a full bowl. The moral of the story… Try things even if you don’t like them, if Isa created the recipe, it doesn’t matter what’s in there… it’s damn good. Thank you!!! Made this the other day and it’s delicious. However, it is a lot for me alone! Do you think it would freeze well? Thanks! I made something remarkably similar using the beloved kålrot (cabbage root = rutabaga) a couple of weeks ago, as a sauce served over stirfried noodles (linguini) (it was what I had in the cupboard). I also used lemon as that was what I had. It looks even better as a soup, nom-nom! This was absolutely delicious and perfect for a cold night! Thank you for such a creative recipe—mmm, rutabagas and Brussels. Can’t wait to make it tonight! Can I just tell you that I made this and it was “delicious” seriously! My husband has gone vegan in an effort to suppress his RA. I struggled with finding suitable dishes until I found your site. Thank God for you. This is wonderful!! Was easy and is fabulous. Thanks so much for sharing your gifts with us. Blizzad blowing, 14 degrees, and this was just perfect for tonight in southeastern Massachusetts. You put the lime in the coconut, you drink ’em both together, Put the lime in the coconut, then you feel better… Thanks, Isa! I do feel better. What should I pair this with if I want to make an appetizer or side of sorts? What about the red curry spring rolls (on the blog.) Or even the zucchini noodle salad with peanut sauce! I really wanted to make this with rutabaga because I’ve never cooked with it..but alas I found some cubed butternut squash on sale begging me to buy it, so I subbed that. Also added half a block of tempeh crumbled up- so delicious to get me through this awful polar vortex!! Delicious! Would be the perfect meal to change minds about Brussels sprouts. I roasted the brussel sprouts in the oven, on a pan with olive oil and added them at the end. Super yummy. I look forward to trying this. The only time I ever ate rutabagas was as a child – my grandmother boiled them and I hated them. I hope I like them in this setting! This is another one of those more-than-the-sum-of-its-parts recipes. Trust Isa to take stodgy sprouts and swedes and make them glamorous. This dish provides a good reason for cold weather. By the way, am I the only one to have thought of freezing leftover coconut milk by the tablespoon portion in ice cube trays? a really great idea! was cooking for an army so made it with cabbage in stead of brussels, plus parsnips, and it was great! and threw some arrowroot in, to thicken the sauce. yum! Made this for dinner last night and it was soooo delicious!!! I’ll be making it again for sure. Thanks! This soup is DELICIOUS. Even the cooking process is such a joy!!! oh the smells of the ginger and lime zest !!! :) I had never tried rutabagas and I love them now! I am a spanish fun. I love your book “Isa does it”. I can´t stop cooking your recipes! I’m updating some of the recipes for my spanish friends (and myself) on my cooking blog… http://www.adaptacionesculinarias.com. February 11, 2014 at 4:49 pm: Jessica G.
I want to thank you for this recipe. I first made it about a month ago, gobbled it up alone in three days, and just finished my second go-round. This last time, fyi, I omitted the chick-peas (canned ones weren’t so great–no time to do from scratch) but pan fried some tofu in the same seasonings that go in the stew. Poured it over brown rice, tofu, cilantro, and sriracha sauce on top and bam! a new favorite is born. I never, ever, would have thought to do anything like this with Brussels sprouts before this recipe. Really tasty and reasonably quick to make. I used about 1 cup of coconut milk because I had a frozen baggie full. Will definitely make again. After adding the ginger, garlic & pepper flakes I removed the Brussels sprouts and threw everything else (except the coconut milk and lime juice) into a crockpot. I let it cook on high for five hours. About 20 minutes before supper I added the Brussels, coconut milk & lime until it was heated through. It was fantastic! 3 out of 4 of us loved it. …and that’s a win for sure! I’m curious as to why in your recipe you said to let the steam escape. I could not/ did not do that. What does the steam do? This was an absolutely delicious recipe! I’m sure I’ll make it again! Made this last night. It was sloppily good. I used parsnips instead of rutabagas and browned the brussel sorouts in a tiny bit margarine amd threw it in at the end & topped each bowl with fresh chopped cilantro & served with corn on the cob. Will def keep this recipe and make it again. Well I made this today, with black beans instead of chickpeas. I found the lime too overpowering. I would recommend just half a lime’s juice. I also put in just under 2 T ginger and it was too much as well, even though I 1.5x the soup and vegetables. Other than that it is delicious. A warning: cut your rutabaga small if short on time! 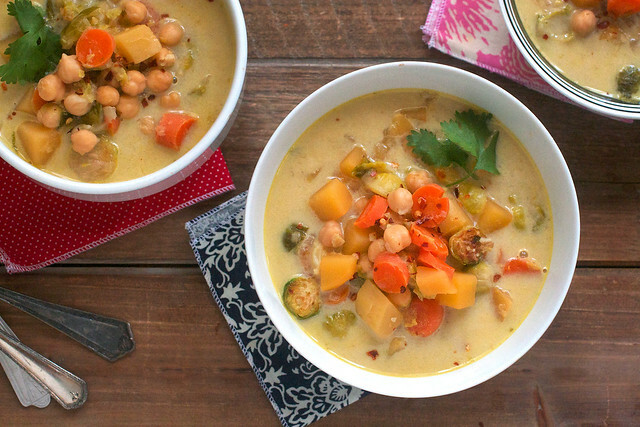 Curry with chickpeas and rutabaga, ammmmazing! Yum! This was so good! (and yes, I did just make this on a hotter than July, hot July day.) You had me, a native Southerner (USA), with just the mention of the word rutabaga (I’m sure you know they are a very common side in Southern cuisine. I was born and raised on a rutabaga. You can find them easily at all grocery stores any time of the year). And the Thai-inspired flavors of the coconut milk, lime, ginger (!) were perfect for the already perfect rutabaga. I made this the other night, but modified a bit. I didn’t think the little ones could deal with the red pepper. My husband is Jamaican, and since there was already ginger, coconut milk, and lime, instead of red pepper I threw in a couple of TBSPs of Jamaican curry powder, and more like 3/4 cup coconut milk. And lots of fresh thyme. My only negative thing was a slight bitterness from the Brussels sprouts. Any suggestions on countering that? I read through the comments before making this, so I figured I’d report back as well! I made this last night, but didn’t have half of the ingredients and winged some major substitutions, and it still turned out great. I also added 2T corn starch to thicken the broth. All other directions and ingredients were followed as written. The concept of the recipe was so great, I’m going to do this coconut stew method with whatever I have around way more often! It’s so easy to pull together and is so delicious, hearty, and healthful! Delicious. I taste the broth while cooking and found it meh, then added the coconut milk and it was amaaaaazzinggggg. Completely tied everything together! I also am enamored with the new mini coconut milk can, so handy. I highly recommend sweet potato too, it’s amazing in this. I was carrying groceries and the rutabaga was just too big for I opted for a celery root instead. Also super tasty. SO DELICIOUS. Love your website Isa. I’m not a vegan, or even a strict vegetarian, but it’s accessible and delicious recipes like this that help me eat vegan much more often! I thought this might be too weird, but I trust your recipes, and it turned out to be delicious! I made a double batch as dinner for 8 (omnivores), and it was a big hit. My man wouldn’t try it because of the brussels sprouts – his loss. I was out of carrots, so I just added more rutabaga, and that worked fine. Thanks for such reliable recipes, Isa. I made your pumpkin pie brownies for dessert! This was SO good. Rutabaga was the one vegetable that I thought I didn’t like and it always made me very sad. I thought, if anyone can make me like rutabaga it’s Isa. I’m now a proud convert and love every vegetable I’ve had the pleasure of meeting. I love your nurturing tone! I don’t particularly like cooking and was motivated when you said “just do your best!” I actually shrieked when I threw the brussell sprouts in the pan and heard a sizzle! HOW did you know that I have rutabagas, Brussels sprouts, coconut milk, AND freshly made chickpeas in my kitchen, just waiting for a chance to hook up? Gonna try this recipe this week . . . . Thank you! My Brussels sprouts-hating partner told me this tasted delicious – thanks for the (vegan!) brownie points! I just made this tonight for the blizzard we’re having in Boston, and wow, was it perfect!! It was a total hit with my partner (and me!). We chose to eat it like stew (no rice). Thanks!! Try it with some star anise and a cinnamon stick. Lemongrass, too, if you have it! I have tried this recipe and was pleasantly amazed. This was perfect every step of this recipe was right on. If you time and follow these directions, you won’t miss a beat. It is robot easy and I consider myself a cook and this didn’t require me or any skills at all. My wife thought this was just another one of my great experiments. hahahaha Thank you so much for a great dish to add to my repartee. Love this recipe! A cold front just came through, so it’s time to buy a rutabaga! Made this for dinner tonight after reading all the rave reviews and I am so glad I did! I made it with potatoes instead, I have a huge bag to get through and it turned out amazing. I could literally just drink the broth, the ginger flavour is absolutely perfect. I imagine it will be even better for lunch tomorrow after sitting overnight. Thank you for such a great recipe! More, more, more! This is the best and delicious what I’m eat! « Isa Does It Sweepstakes!